In my experience you can avoid a lot of headaches if you can manage to embed the audio to the video signal before it hits the computer. Matching and predicting latency for different signal paths in a computer with different drivers and hardware interfaces is incredibly difficult. Unfortunately DSLR's often are not easy to manage with external audio and I'm not sure if there are good HDMI audio embedders out there. 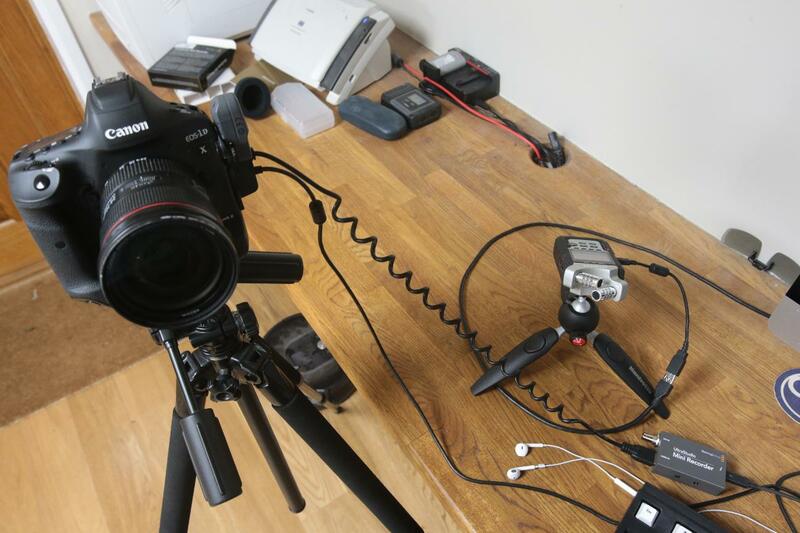 Most DSLR's treat the HDMI output as merely a preview mechanism. I do video over IP transmission / link monitoring gigs for live TV sometimes and I try to stay with SDI and professional gear just to avoid these issues. (Though even the cheapest HD-SDI cameras are a thousand bucks). 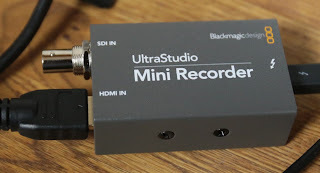 I definitely recommend 48 kHz with the Ultrastudio and all videostuff in general. A lot of software and hardware kind of expects it and may get confused if something different is used. Also it is a good idea to connect a video feed to the thunderbolt adapter before starting any application that ingests the video. 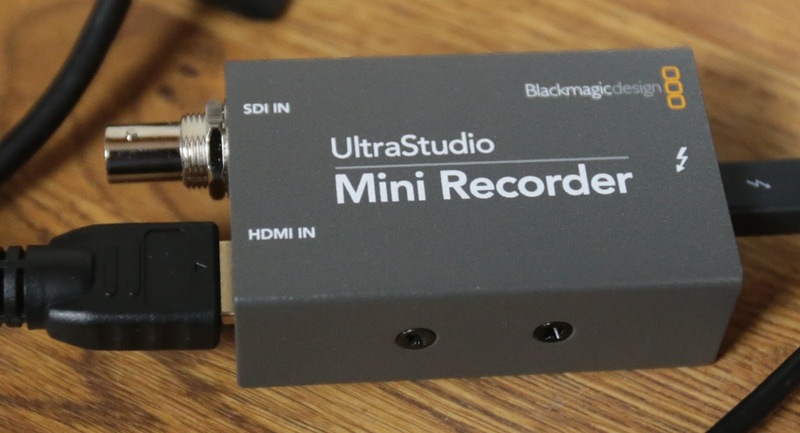 I have had nasty issues where the Blackmagic driver thought the embedded audio was 44.1k instead of 48k just because it did not have a live feed connected at first. I agree with the above commenter that you should try to embed audio upstream of capture with your BlackMagic device. In theory (drivers being in order), the audio should stay in sync, the problem you will find with consumer applications is that the drivers that provide core audio functionality aren't very good (software such as XSplit which can talk a little more 'natively' to the box don't tend to have such problems). You need to be very aware of any options that allow you to listen to yourself or cancel echo/noise as these can cause delay. Even with 48k you may well suffer issues as the clocks on the sound card and the video capture card are free-running and will not be PPM correct unless you can sync them with word clock (which you cannot). Therefore one sample of audio doesn't always fit into one frame of video (or rather, the clock generating the audio stream attached to the video isn't the same as the sound card) and you can get some weird glitches going on, this is jitter. 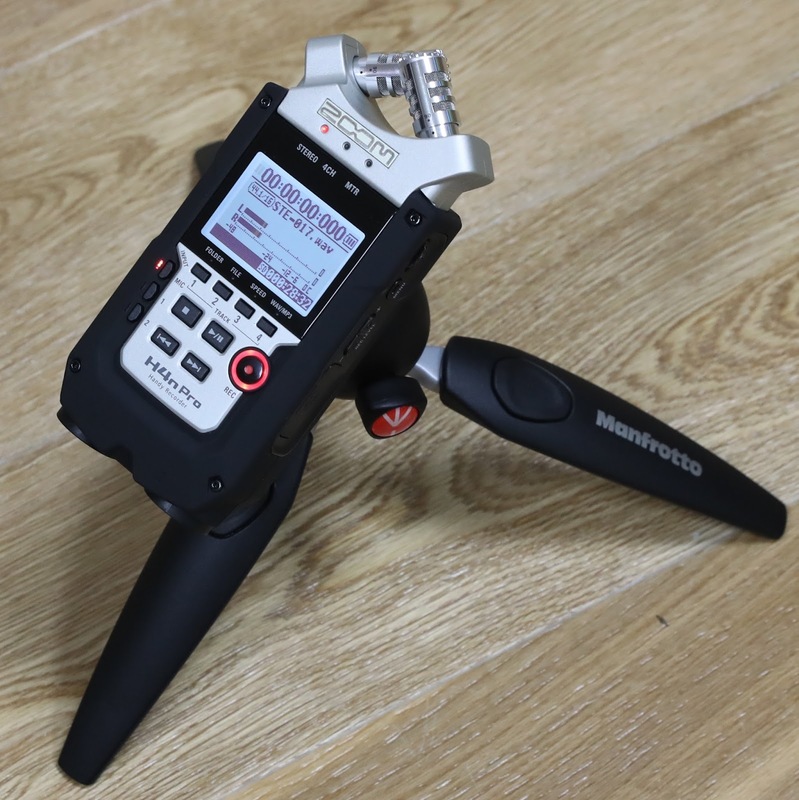 If you don't want to purchase a camera with balanced audio inputs (such as a Canon XF105), you could look at a condenser-style microphone (Beyerdynamic MCE85s are good), preamp and embedder box. I think the bad sync we say may have been face time as we managed to see it even using internal mic and even external mic in the canon and so taking audio over HDMI. I tried FaceTime with this yesterday and audio was way out using Mac internal mic and camera, but telling FaceTime to change audio to another source (the H4) fixed it, in call. At least I know I have to watch out for it. We'll see on next interview. A couple of 'optics' comments if I may. I've watched a few interviews on RT and a couple of visual mistakes people often make is setting the camera too low (or less often too high) - it should be just below eyeline IMO, and secondly paying insufficient attention to the background - you want to shoot for completely neutral, or vaguely related to your status as 'expert'. The up/down and size is very much dictated by the TV channel - telling me where they want me in relation to graphics over lay and how they will crop and so on. The background, well, with using my Mac built in camera which is chained to the desk (literally) gave few options but obviously a proper camera on a tripod with a choice of lenses gives more scope within my office. I don't (currently) have blank walls, but maybe I should make one. However, it was amusing to have the bar behind me. Using large aperture helps as whatever background can be blurred to be less distracting. Sometimes just being in a hi-tech office as a background can be a good choice for the sort of talks I do.